Enjoy the masterful blend of minimalist design and warm sophistication at our luxury hotel embellished with Victorian accents from the estate of North American railroad pioneer William Cornelius Van Horne. 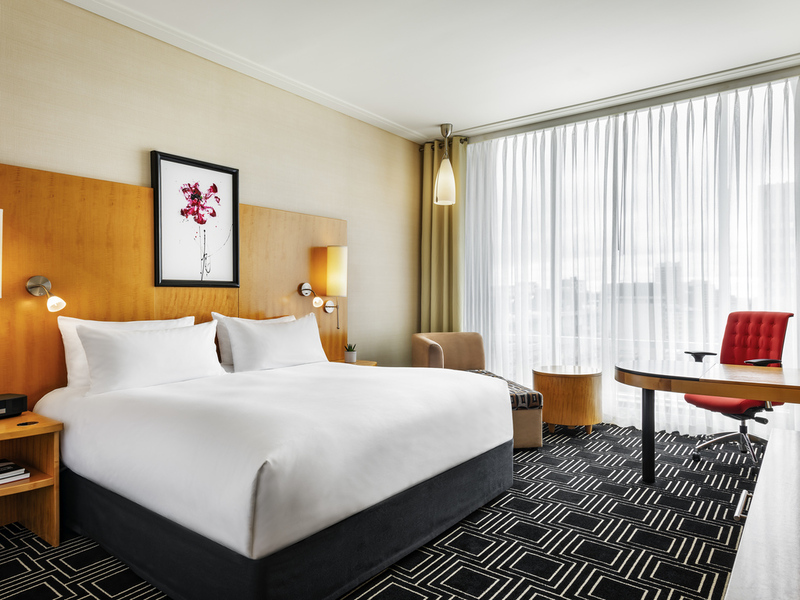 Choose one of 241 elegant and stylish hotel rooms or 17 suites all featuring Sofitel's luxurious feathertop and duvet sleep system - SoBed. Montreal is a vibrant New World city that has retained a hint of the soul and spirit of the Old Continent. Walking through the historic center in summer or safe from the winter cold in the underground malls, Montreal is a great year-round destination. Approaching from any direction, follow the sign ''Centre-Ville'' toward 720 East. Take exit #4 rue de la Montagne - Keep left and follow De La Montagne NORD - Rue St-Jacques.- Coming out of the exit, keep right towards Rue ST-JACQUES. 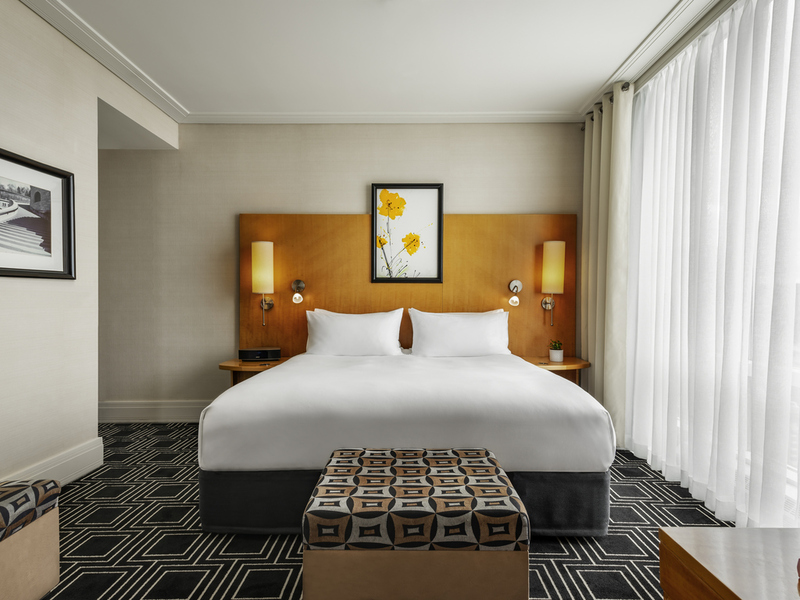 Sofitel Montreal offers spacious comfort in 17 indulgent suites. Enjoy the latest technologies floor-to-ceiling views and spacious marble bathrooms featuring Hermès bath products at our Canada luxury hotel. A 30 m² room with floor to ceiling windows, goose feather comforter and pillows, a bright work area with WIFI Internet, an LCD screen, a Bose radio alarm clock with an iPod dock, and a complimentary Nespresso coffee machine. A 375 sq. ft. room (35 m²), with floor-to-ceiling windows, goose feather comforter and pillows, bright work area with WIFI Internet, an LCD screen, a Bose radio alarm clock with an iPod dock, and a complimentary Nespresso coffee machine. A 570 sq. ft. room, with floor-to-ceiling windows, goose feather comforter, work area, Wi-Fi, LCD screen, a Bose radio with iPod dock, coffee machine, fax, DVD player and lounge area. Complimentary Nespresso coffee machine. A 700 sq. ft. room, with floor-to-ceiling windows, goose feather comforter, work area, Wi-Fi, LCD screen, a Bose radio with iPod dock, complimentary Nespresso coffee machine, fax, DVD player & lounge area. Marble bathroom, rain shower, separate bathtub. A 97sqm, 1050sqf. suite on Penthouse Floor, expansive windows, goose feather bed & pillow, separate comfortable sitting & work area. Complimentary Nespresso coffee machine, marble bathroom, separate bath with Hermès products, rainshower and bathrobe. Inspired by French cuisine and infused with international flavors our restaurant Renoir offers inventive cuisine utilizing local Montreal products. Enjoy the spacious terrace for fine dining during warm weather. Allow yourself to relax in refined surroundings from the comfort of one of the elegant leather armchairs at our Montreal lounge Le Bar. Enjoy a French style coffee break or custom-made cocktails as our staff caters to your desires. With 6900 square feet of sophisticated space, Sofitel Montreal Golden Mile offers elegant meeting rooms with state of the art audiovisual equipment. Our Montreal event venues can be customized to your specifications to make any event unforgettable. Choose from the elegant Picasso Ballroom and four meeting rooms with natural light, stained glass and natural sycamore accents. Add a cosmopolitan flavor to your meetings with exceptional amenities and superb French catering. With 6900 sq.ft. of sophisticated space, Sofitel Montreal golden Mile offers elegant rooms with a unique French touch. Add a cosmopolitan flavor to your meetings with a superb French catering by our chef Olivier Perret. Our Executive Chef, Olivier Perret, masterfully blends French flair and service with a creative cuisine featuring local Quebec products. Roland Del Monte, Executive Pastry Chef and Meilleur Ouvrier de France, is creating unique Sweets and pastries. Sofitel Montreal Golden Mile accommodates your wedding party with a prefered rate in 258 luxury hotel rooms and suites, lavishing them with ultimate comfort and sophisticated style. 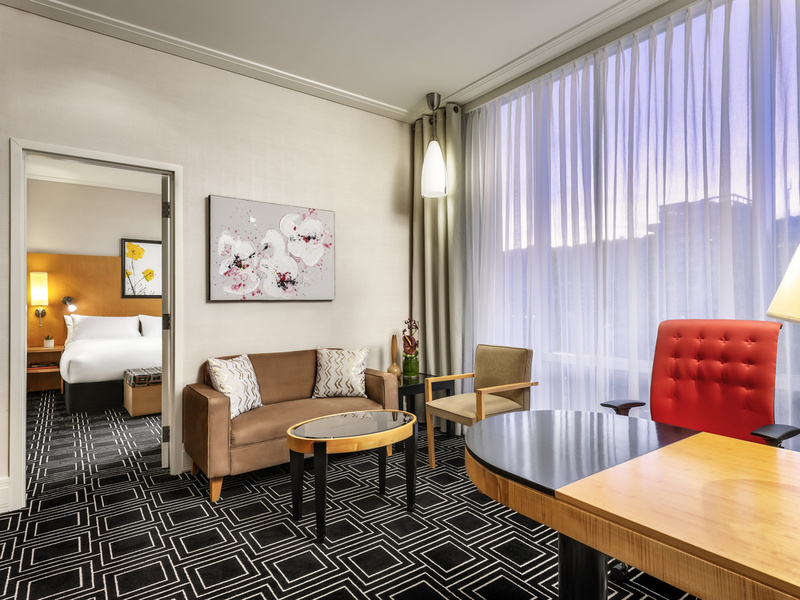 Our rooms feature floor to ceiling windows, marble bathroom & WIFI. Our Wedding Specialist will work with you to create magnifique moments for you and your guests. Édith Lajeunesse - Edith.Lajeunesse@sofitel.com - +1 (514) 788 3010. Visit www.restaurant-renoir.com/Private-Events for our Wedding packages. 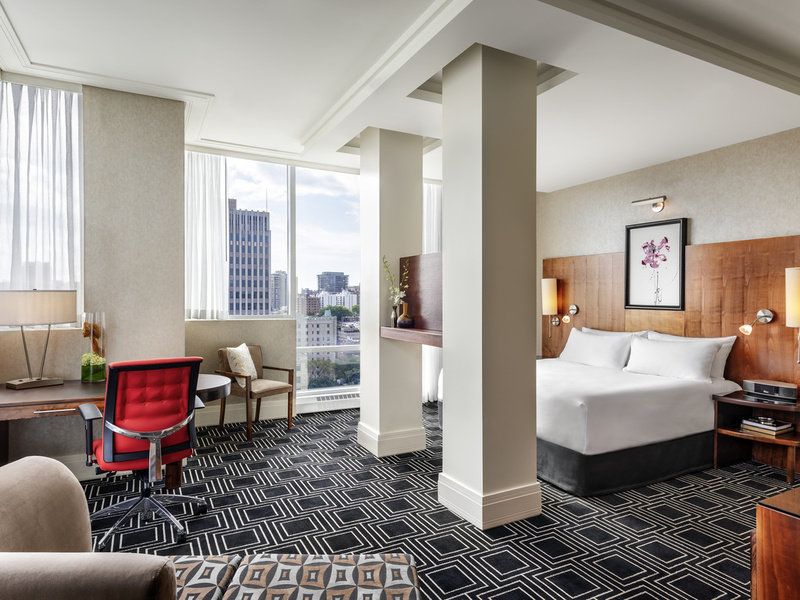 Sofitel Montreal Golden Mile is ideally located in the heart of city, at the foot of lush Mount Royal Park, next to renowned boutiques and museums. To make the most of our location, let our Clefs d'Or Concierge team guide through their addresses. 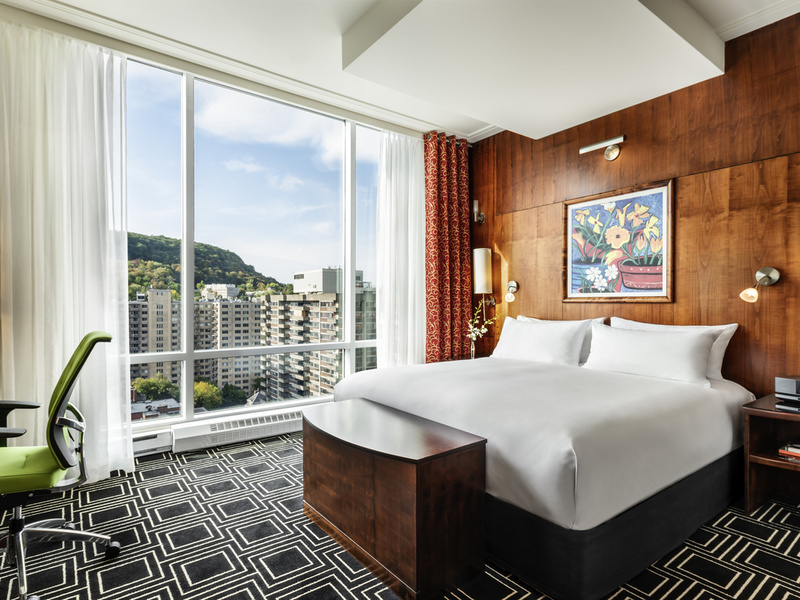 Sofitel Montreal Golden Mile offers a variety of the best hotel services and amenities to make your stay in Quebec unforgettable. Our luxury hotel features a fitness center, sauna, complimentary Wi-Fi and more. To make the most of our location in the heart of the historic Golden Square Mile, let our Clefs d'Or Concierge team guide you through its unique addresses for shopping and culture.